Dr. Leigha M. Nielsen graduated with honors from the University of Houston College of Optometry. She also holds degrees in Biology and Business Management. During the course of her studies, she participated in research focusing on keratoconus, a degenerative eye disease, which was presented at the Associates for Research in Vision and Ophthalmology (ARVO) and the American Academy of Optometry (AAO). 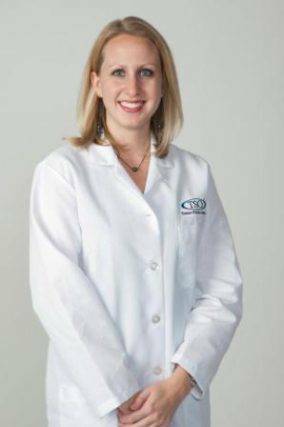 Her professional memberships include the Texas Optometric Association, the American Optometric Association, and the Bexar County Optometric District Society. Dr. Nielsen practices full-scope Optometry and works with patients of all ages, specializing in standard and specialty contact lens fittings, minor ocular surgeries, diagnosis and treatment of amblyopia, anterior segment pathologies, cataracts, glaucoma, and retinal pathologies. She also handles a great deal of refractive corrective surgery co-management and cataract surgery co-management. A strong believer in community and family, Dr. Nielsen plays an active role in the city of Schertz where she owns and practices at Texas State Optical, and is excited to take that same approach to her new location in New Braunfels. Both of these locations specifically highlight the importance of caring for the eyes of the entire family with specific pediatric care designed to provide children with comprehensive testing and therapy to give them every advantage in life. Children having that ability to confidently go to school and learn without the struggles and disadvantages vision related problems can incur is why she has relocated her full-service vision therapy clinic, Nielsen Vision Development Center, to be housed at Texas State Optical – Oak Run. By providing every option to parents and their families under one roof, we can ensure that no half measures are taken when treating a child’s vision. Dr. Nielsen will always take the time to explain the results of your eye exam, go over your options and listen to your eye care needs. Because maintaining good eye health is an ongoing partnership, we encourage you to ask questions and share your health information, which could be vital to monitoring, diagnosing and treating potential vision problems.